Heterogeneous traffic existing in developing countries such as in India is characterized by vehicles with very diverse static and dynamic characteristics. The various types of vehicles, other than cars in the heterogeneous traffic stream can be converted into equivalent passenger cars so as to express the heterogeneous traffic volume in terms of corresponding passenger car units (PCU). The subject of PCU has been studied on intercity, urban roads and at intersections controlled by traffic signals quite extensively. But studies on PCU values of vehicles on the downstream of signalized intersections have not been explored so far. The arterial links existing at downstream of traffic signals are designed to progress traffic with varying acceleration and deceleration. Vehicular interactions which take place within platoons and between platoons along such arterials are the predominant factors affecting vehicular progression. Hence there is a need to derive PCU values of vehicles along signalized corridors. The present study analyzes traffic flow data collected at the downstream of a signalized urban arterial to determine PCU values for various types of vehicles based on three methods. One method is the homogenisation coefficient method whereas the other one is the speed-area ratio method. The third one is a new method based on speed differential and area ratio is proposed in this paper which considers the effect of speed variation of vehicles for estimating PCU values. In this study, PCU values estimated based on speed differential-area ratio concept are found to be more logical compared to other methods as this method could incorporate the considerable variation in static and dynamic characteristics of various vehicles which progress along the downstream of intersections. The authors acknowledge the opportunity provided by the 4th Conference of the Transportation Research Group of India (4th CTRG) held at IIT Bombay, Mumbai, India between 17th December, 2017 and 20th December, 2017 to present the work that forms the basis of this manuscript. 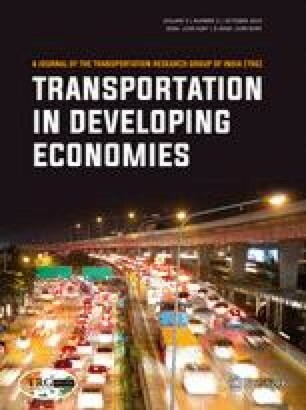 The authors acknowledge the support provided by the Centre for Engineering Research and Development (CERD) and the Transportation Engineering Research Centre (TRC), Government of Kerala, India.